Our office has heard many clients report that they were pulled over because the police officer told them they had illegal tinted windows. 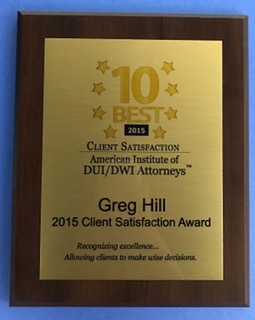 The client usually suggests that the police officers had a hunch that our client was DUI, on probation, had drugs in the car or was wanted for an unsolved crime. The tinted windows, in other words, were just a pretext for the police to set up our client for a search, an arrest and much bigger charges than just illegal tinted windows. The Gist of This Article: There are defenses to the charge of illegal tinted windows and the definition of windows which have illegal tinting is often not even known by police officers when making a traffic stop. Read the following article better understand this often pretextual reason for a traffic stop or ticket. The client suspects that his windows were in fact legal, making the traffic stop illegal and all evidence found subject to suspension. This article seeks to clarify what exactly constitutes illegal tinted windows. In other words, it is illegal to have completely tinted front windows or completely tinted side windows. An exception exists for a driver with a medical condition requiring tinted windows, but this must be verified by a licensed physician. A narrow strip of tinted material, however, is allowed on the windshield, but it must be no lower than twenty- nine inches from the bottom of the windshield. No tinted material may be red or amber in color. There also cannot be any lettering that that blocks one’s view outside the car or reflects light into the eyes of drivers of oncoming cars. If the rear window is tinted in any way, the car must have outside rearview windows on both sides, according to the CHP website. If any tinting material becomes bubbled or otherwise worn, it must be removed or replaced. Our office has informally asked several police officer’s about this law and what constitutes a violation. The consensus response is that basically any after-market window tinting is illegal. Such an approach raises the rhetorical question of, “well, what about all those window tinting businesses? Are they just selling illegal products? How can that be legal? In the 1983 case of Klarfield v. State of California (1983) 142 Cal.App.3d 541 (191 Cal. Rptr. 330), this rhetorical question was addressed. The case arose when Transparent Glass Coating a California business, installed tinted windows on a customer’s car. The customer, Cintron, then received a ticket for the car’s violation of Vehicle Code § 26708. The customer then went back to the store, irate and demanding the store remove the tinting and pay for the ticket. The business consequently brought an action for a declaration of its rights to continue doing business. The court held that Transparent Glass Coating was entitled to conduct business in a legal manner if it installed “factory” grade tinted windows and any tinted windows pursuant to a customer’s medical condition. The shop was also legally entitled to install certain side and rear windows in trucks and buses. Such glass would be installed to replace windows broken in a crash, burglary or otherwise. When an Arrestee Is Detained, Is It Illegal to Search a Car without a Warrant?